My version of gado gado: Boiled cabbage and carrots, steamed broccoli, pan-friend tofu, slices of tomato and cucumber with peanut sauce and fresh herbs. 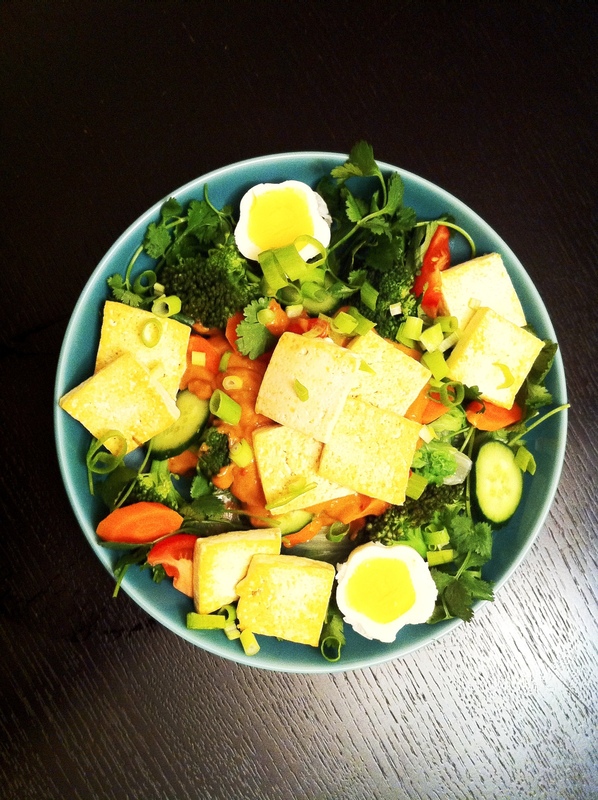 This entry was posted in Food and tagged food, Gado Gado, Indonesian cuisine, Indonesian food, tofu. 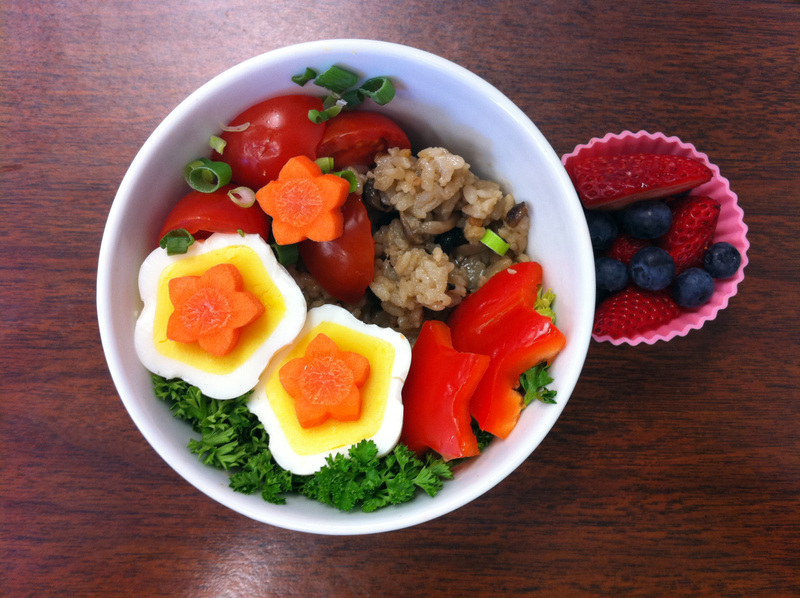 Mixed mushroom rice, salad with mozzarella, a hardboiled egg and berries. 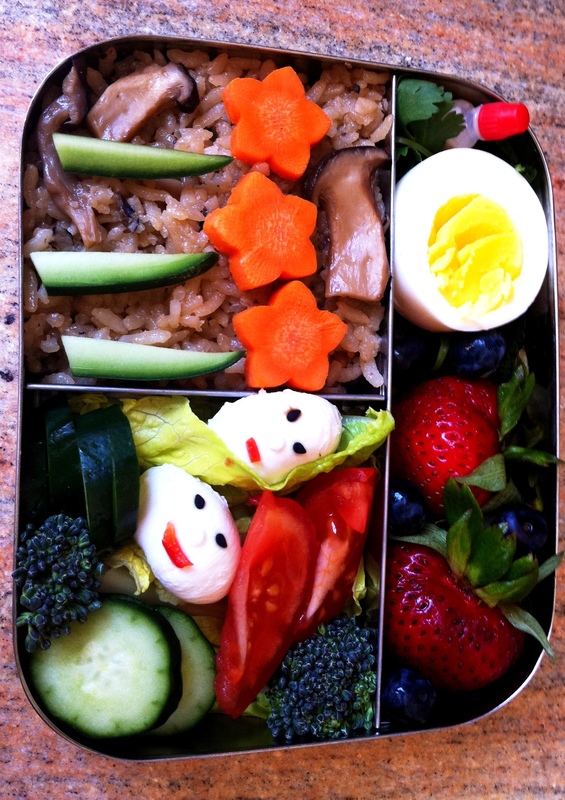 This entry was posted in Bento, Food and tagged bento, bento box, LunchBots, mozarella, mushroom rice. 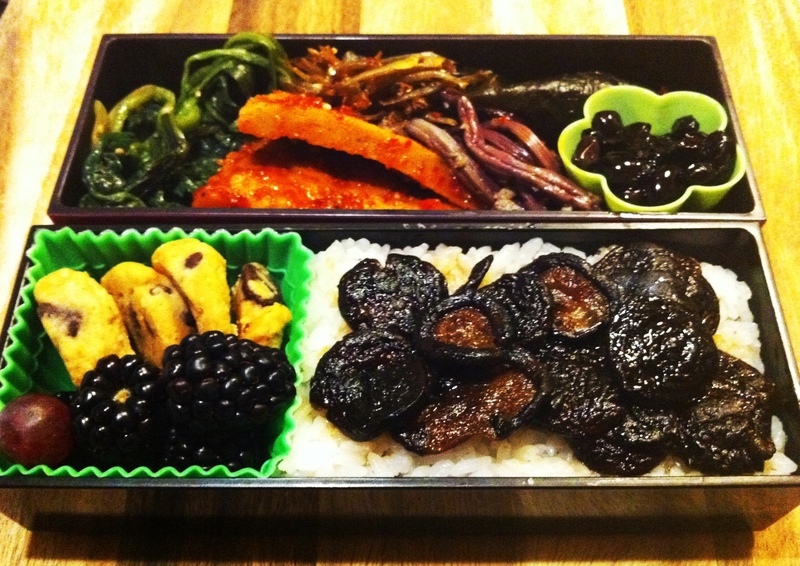 Teriyaki mushrooms over rice next to fruit and mini chocolate chip cookies; assorted panchan of seasoned spinach, bracken, black beans, spicy fish cake, marinated perilla leaves and dried anchovies. I normally make my own Korean side dishes, but April has been a crazy month. I’ve been finishing up my master’s project and had little time to belabor my many loves, including cooking. So I went crazy in the pre-made section of the Korean market last week and have been happily transforming my purchases into kim bop, bibim bop and now a bento. Fly out tomorrow to defend. What a relief! I can get back to cooking after that … At least I made the mushrooms from scratch! Happy bento days ahead. My checkout haul at Kukje Market in Daly City. 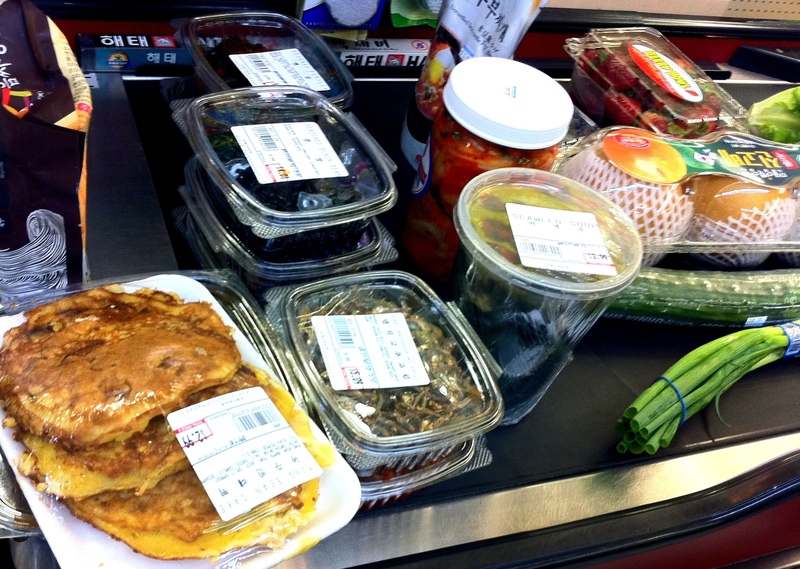 It's amazing how far $84 can go at the Korean market versus at Whole Foods. I go crazy whenever I shop there, though I have to say their miyok guk tastes sadly nothing like my mom's. This entry was posted in Bento, Korean Cuisine and tagged bento, Korean. A little kim bop to get the weekend rolling: bulgogi, shigumchi namul, egg and gobo. Yum. 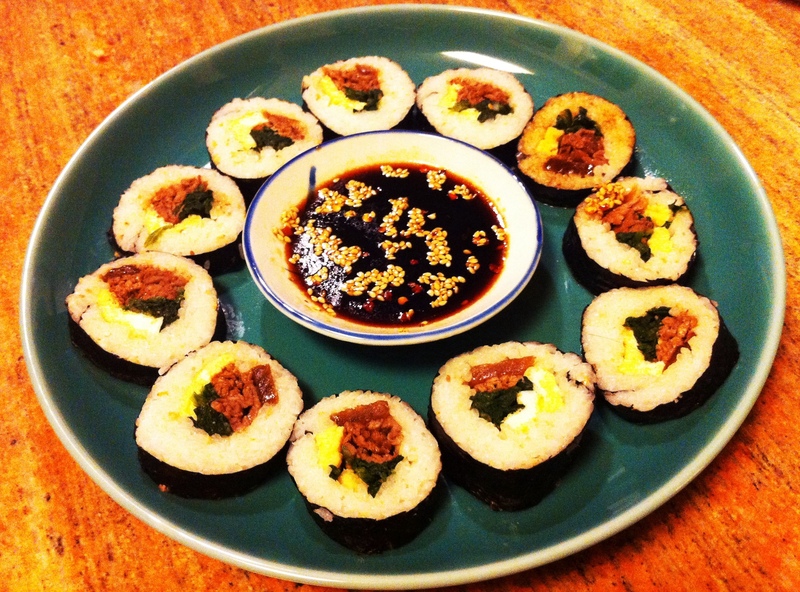 This entry was posted in Food, Korean Cuisine and tagged bulgogi, kim bop, Korean food, rice roll. Fried tofu and edamame nuggets with baby lettuce, radishes, cucumbers and multigrain rice; bell pepper kinpira and a berry-citrus fruit salad for dessert. Ft. Lauderdale! The Everglades! The Keys! Napa Valley! A bevy of beautiful places and faces in a whirlwind week and a half. I could never get enough of dolphins, anhingas, stingrays and miniature deer. Sleeping in a suite is all the better for having slept under the stars. And I love drinking beer at the No Name Pub on Big Pine Key, Fla., as much as I do sampling the wine pairings Ad Hoc in Yountville, Calif. But have to say, I am so happy to be back home and making bento on this most beautiful of San Francisco days. This entry was posted in Bento, Japanese Cuisine and tagged bento, bento box, Taken with my iPhone. 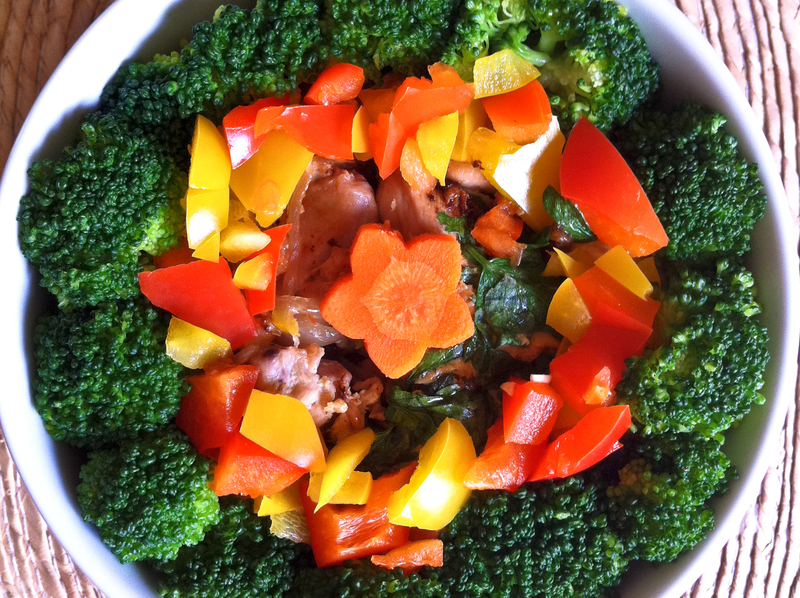 A ring of blanched broccoli florets and bell pepper "spare parts" lines my oyakodon (chicken and egg donburi). A bed of multigrain rice sits below. There are some lessons that you are supposed to learn again and again. I think keeping it simple is one of them. I tried cutting out all sorts of fun shapes from bell peppers: dolphins, whales, flowers … But, really, I’m feeling more somber than that. 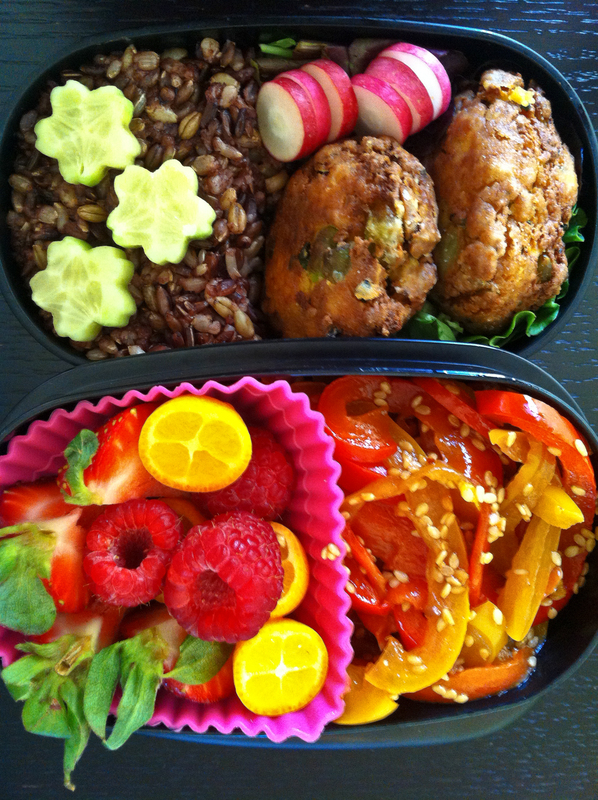 So instead, this simple bento brought just enough sunshine into my cloudy day. 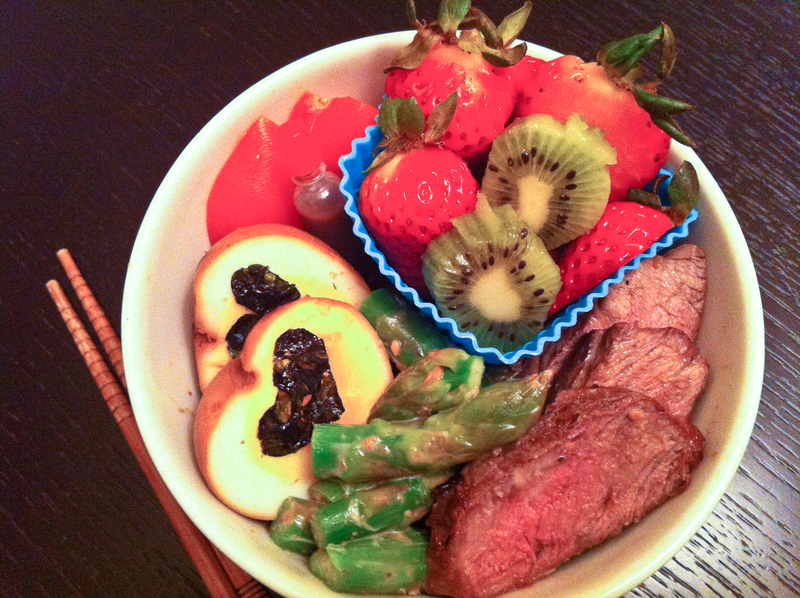 This entry was posted in Bento, Food and tagged bento, chicken and egg donburi. So I’ve been getting bento inspiration from all over … But I must give credit where it is due. I first fell in love with the idea of bento this January, when I spotted “The Just Bento Cookbook” at a bookstore in Santa Cruz. I was making my annual New Year’s pilgrimage to the coast and contemplating ways to bring new joys into 2011. And there it was, this book that I just couldn’t put down. Since then, co-workers have gifted me books on bento, and I’ve found so many amazing bento-makers on the Web. It has been a pleasure cooking, learning and eating my way down this road. So thank you, Makiko Itoh, for the inspiration. This bento’s for you! 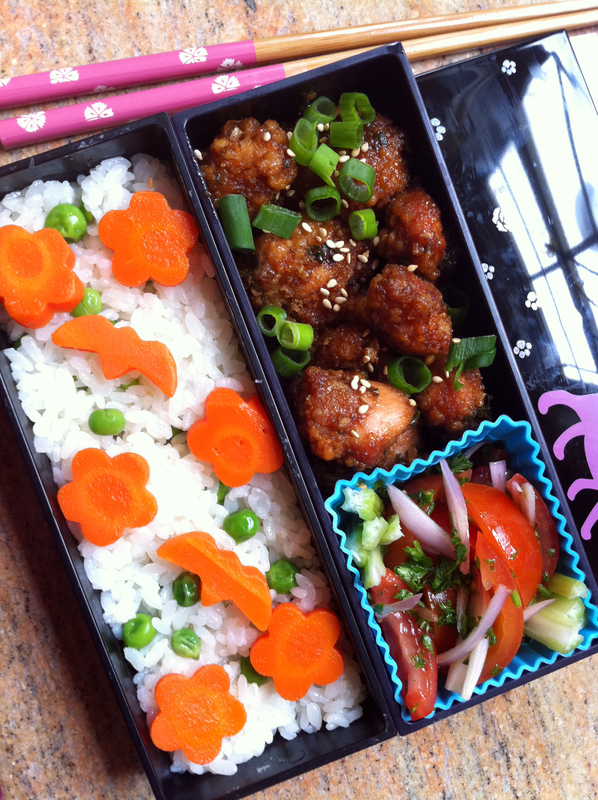 This entry was posted in Bento, Food, Japanese Cuisine and tagged bento, bento box, chicken kara-age. Just came back from a long weekend in Utah. I had made a few molded hard-boiled eggs before I left. My hearts, however, didn’t turn out quite as nicely as my star. One heart, with a yolk so off-center that it poked out the side, was so unattractive that I had to eat in on the spot! The other one wasn’t quite so bad, but it still didn’t look much like a heart … Still, why waste food? So I rolled the misshapen sucker around in some soy sauce, sugar and ginger until it was nicely coated, cut it in half and then popped some asymmetrical nori hearts on top before tossing it in the bowl. If you’re going to be misshapen, might as well be proud. Guess, like my bento, I am both in and out of shape. 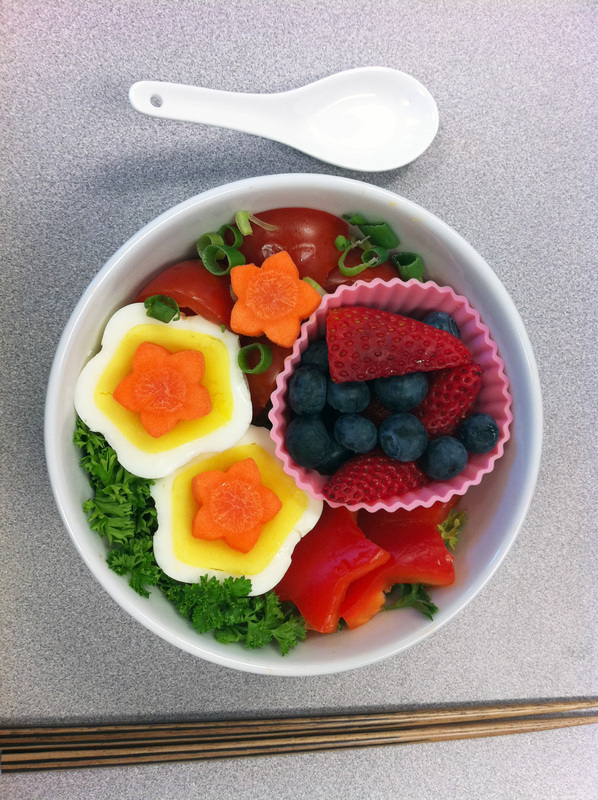 This entry was posted in Bento, Food and tagged bento, bento box, molded hard boiled eggs, multigrain rice. In light of yesterday’s crab roll disaster, I decided to keep it simple today. Besides, I’m about to get on a plane. So I prepped the mixed mushroom rice and eggs last night, and then all that was left this morning were the fun bits — making stars. The pink silicone liner was the most I could cough up for Girls’ Day. Pink has never been my favorite color, unless you count magenta. I need something bold. This entry was posted in Bento, Food and tagged bento, bento box, hardboiled eggs, molded hard boiled eggs, shitake gohan, stars. My roomie noted the funky crab-shell-like texture of the bell pepper. “How did you do that?” she asked. Truth be told, it’s just puckered from being in the fridge too long. But sometimes, things do work out. And it’s OK to make mistakes. Off to the Utah slopes for a long weekend. I’ll be making bentos out of snow. Oh, yeah. And that’s supposed to be a pickled ginger and Italian parsley rose. Ha! 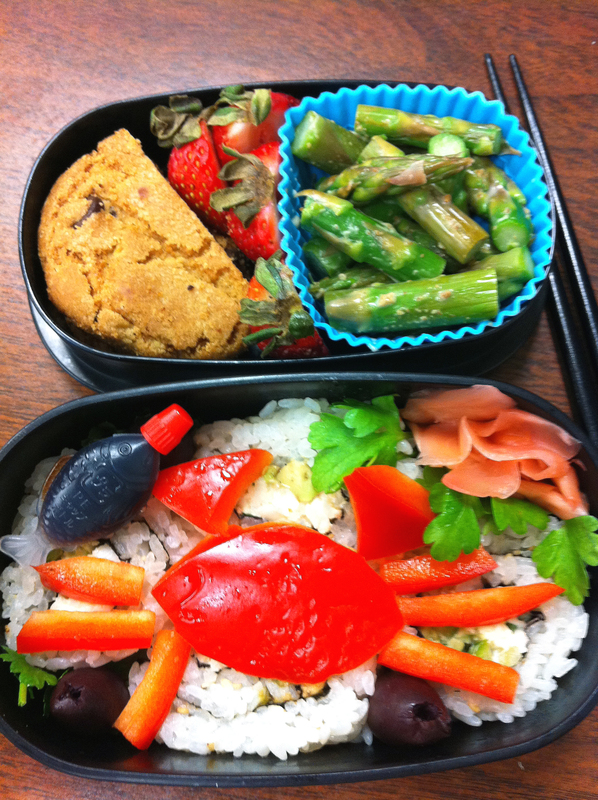 This entry was posted in Bento, Food and tagged bento, bento box, California roll, crab.